IMAS researchers are working with local fishers to investigate the spawning behaviour and catch trends of calamari in north Tasmania. Figure 1. (a) Relative fishing effort and (b) catch for calamari on the northeast (NEC) and northwest (NWC) coasts of Tasmania. Data excludes records for the month of June for all years, as this is not currently available for the 2017/18 season. 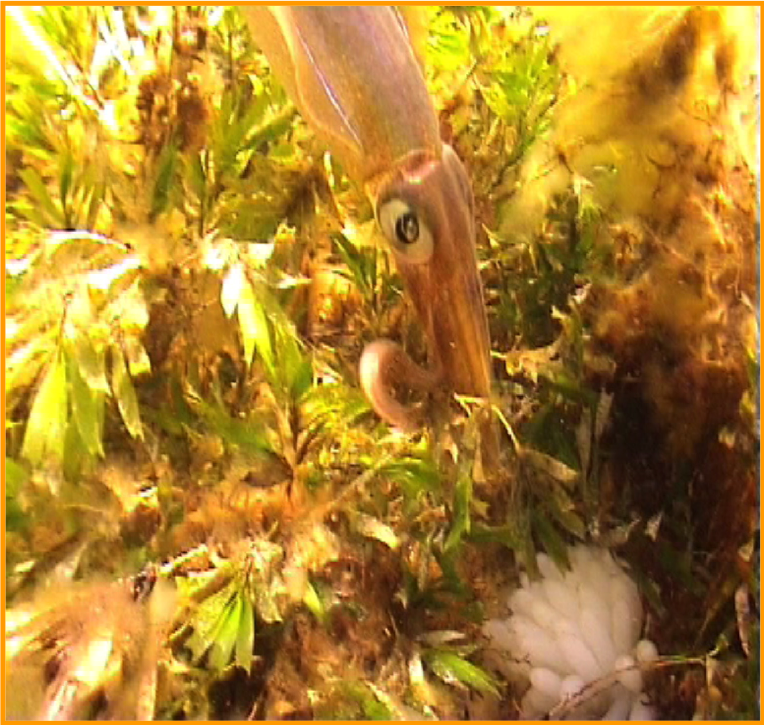 Given these issues, a decision was made to investigate the spawning dynamics of calamari along the north coast, with a key focus on defining the timing of peak spawning season and identifying potential spawning ‘hotspots’ along the coast. Managers could then use this information to implement a precautionary spawning closure to provide maximum opportunity for calamari to spawn on inshore seagrass beds. These inshore seagrass beds are where most catch occurs, as calamari aggregate in these areas particularly during peak spawning times, resulting in high catch rates. Calamari live for only a year and die naturally soon after they have completed spawning. So, the challenge with a spawning closure is to maximise the opportunity for individuals to lay their eggs during the peak spawning period, but re-open the fishery before they die after spawning. In October 2016, IMAS researchers worked with local fishers to identify the best areas to conduct monthly monitoring of spawning activity of calamari in the region. Peak spawning began in mid-October, with lower levels of spawning observed through to late November. By early January 2017, many egg masses were showing evidence of hatching. Based on the timing of peak spawning and increases in fishing effort, the northwest and central north coast were closed to fishing in October 2017 for around three weeks, offering some protection during peak spawning season. Monthly dive surveys resumed in September 2017. Unlike 2016, there was no evidence of peak spawning activity observed in October 2017. Surveys also revealed very low levels of spawning in November and December, providing no evidence of a seasonal peak in spawning during 2017. Prior to the fishery closure in mid-October, and after it re-opened, commercial fishers were also reporting very low catch rates, suggesting that the calamari were not moving into the seagrass beds to spawn. Preliminary commercial fisher logbook data suggests catches in 2017/18 are well down from previous years (Figure. 1b). Figure 2. Example temperature plot for the northwest region in late 2017-early 2018. 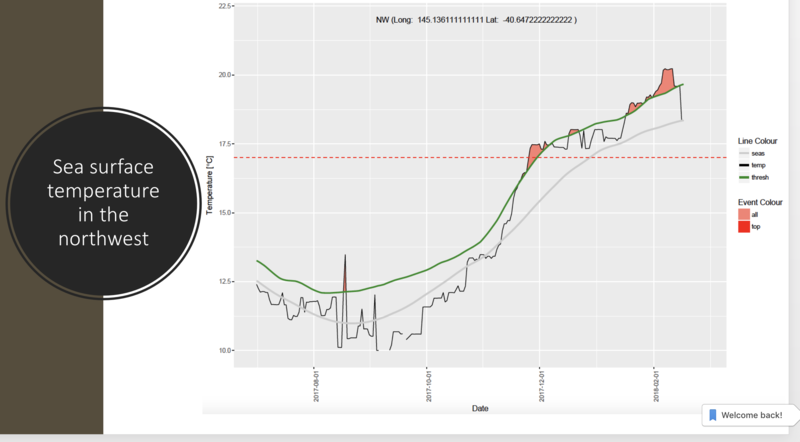 The grey line is the seasonal average, the black line is the reported water temperature. The green line is the 90th percentile above the seasonal average and the red patches indicate heat wave events (Figure courtesy of Dr. Craig Mundy, IMAS). some combination of these impacts. The suppressed catches and spawning were observed along the entire north coast, so it is unlikely that the seal relocation to the northwest was the main cause. If this were the case, a more localised effect would be expected. An investigation of water temperatures along the north coast showed that two anomalous events occurred in late 2017. First, water temperatures from early-September through to late-October were cooler than the seasonal average for that time of year. Water temperatures then warmed rapidly, tracking the seasonal average in late-October through to early-November, before rapidly increasing to temperatures well above the seasonal average from mid-November until January (Figure. 2). There were several periods during this time considered heat-wave events, with water temperatures above the ninetieth percentile of the seasonal average and persisting for more than five days. 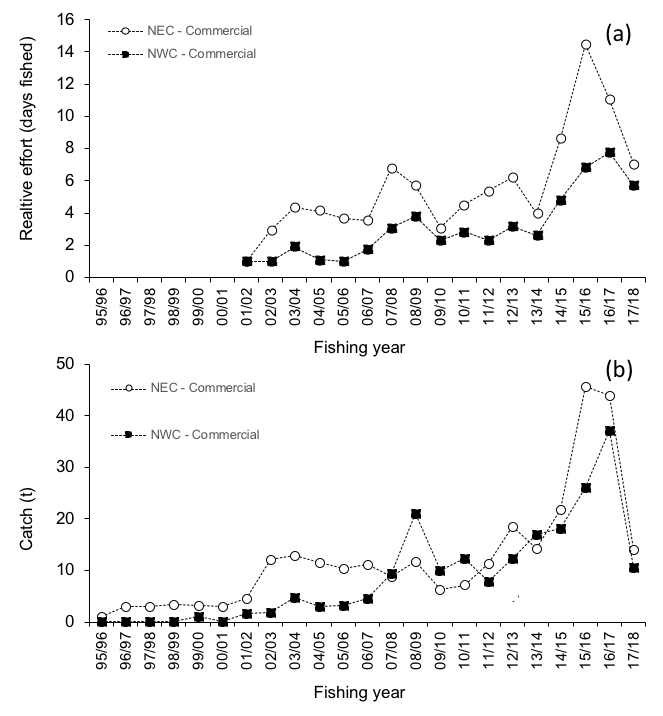 While it is likely this series of environmental anomalies played a role in the reduced spawning and decline of catches, since the calamari may not have had environmental cues to move into the spawning areas, it is also possible that large catches in the previous years have compounded the effect. It is difficult to draw strong conclusions from what is effectively a single data point, so IMAS will continue the dive surveys from October 2018. However, further closures during peak spawning will protect against the potential for over-fishing during this period. A one-month closure has been confirmed for the entire north coast for October 2018, as a precautionary measure to ensure that calamari are protected during their peak spawning period should they return to spawn.